Here’s what happened during the qualifying motos at the 2018 MXON at Red Bud. The day started out wet and stayed that way. I didn’t really rain until later in the day, but it was like we in the mist of clouds the whole time. Jeffrey Herlings went down in the first turn of the MXGP moto and had to go straight into the pits. He headed out way dead last. How far could he possibly make it up? Colton Facciotti fell a couple times and had some riders hit him pretty hard. He put his head down and charged. Herlings made it all the way up to 4th and then passed Gauthier Paulin to take 3rd. It was a pretty solid effort. It was really cool to see Kevin Windham out there again, but, judging from lap times, he was glad it was only 20+2. He was 21st for Puerto Rico. Eli Tomac was 5th until lap 8 of 11 and he was finished. His bike gave up at the bottom of Larocco’s Leap and he took a DNF. Ken Roczen ran 2nd the whole moto and lost touch with the leader out front, late in the moto. The rider out front was none other than 9-time World Champ, Antonio Cairoli who is money at these things. Colton fought his way up to 17th by the flag. The Godfather took a convincing win. The crew trying to figure out what was wrong with Eli’s bike. Aaron Plessinger was in full Team USA mode. Jess Pettis blasted off and was 10th at the end of lap 1, but he had to make some early passes to get there. Germany’s Henry Jacobi was impressive early on with the lead. Plessinger led early but then had troubles and pulled into the pits for goggles and ended up 11th. 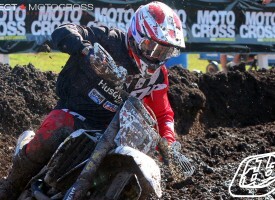 Jess rode very well at his first MXON and took 8th. Hinter Lawrence was impressive and pressured for the lead late in the moto, taking 2nd. Dylan Ferrandis took the win. The team was pretty pumped for Jess. Tyler Medaglia has a close call with moto winner Glenn Coldenhoff of the start of the Open moto. The crowd went nuts for Travis Pastrana who fell back to 27th by the time the flag waved. Max Anstie headed out in last place and then almost killed James Lissimore and managed to completely cover him head to toe with roost. He made it up to 9th. Medaglia battled hard and took 13th at the flag. Justin Barcia got this close to the leader but couldn’t quite make the pass and settled for 2nd.